Joshua and Gina Caro joke around before he leaves for Camp Grey Dove, a camp for kids who have siblings with cancer. Gina has leukemia. 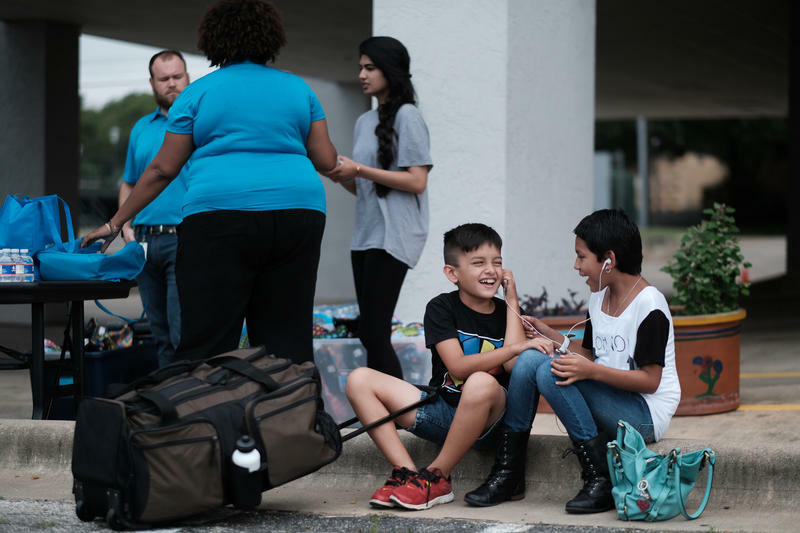 Gina Caro, 12, drapes a protective arm around her 9-year-old brother, Joshua, as they sit on a curb waiting for a bus to take him to camp. 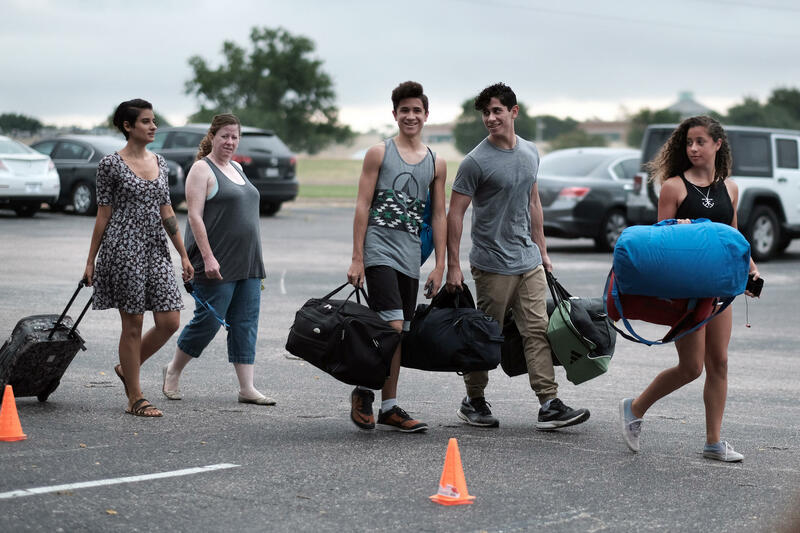 This is Joshua’s first time going away to camp, and he’s a little nervous. But Camp Grey Dove is geared specifically toward children like him. Roughly 50 kids who have siblings with cancer are attending the free weeklong camp in Killeen. Grey Dove is run by Any Baby Can, a nonprofit that focuses on issues related to childhood development. Joshua and Gina's mom, Brenda Bazaldua, says Gina’s cancer is in remission right now, but their family has gone through some really tough times. She says watching Gina suffer has been hard on everyone, but especially the kids. “Not only for Gina [who] was the one suffering," she says, "but for Joshua to see that suffering and not being able to do anything about it." Bazaldua says some days it was clearer than others that Joshua was having a hard time understanding what was happening to Gina. “Joshua, some days he would just space out completely – 'I don’t understand what is going on, and I hate this,'” she says. Bazaldua says she’s excited Joshua will get to meet other kids who have siblings with cancer and that it could help him. A group of roughly 50 kids, age 7 to 14, are attending a free weeklong camp geared toward a special life experience: They all have a sibling with cancer. Ethan Jones, one of the counselors, has been going to Camp Grey Dove for years. The first time was when he was 7 years old; his twin brother had leukemia. Jones says the camp was really helpful during that part of his life. Jones says that wasn’t the case in other parts of his life, like school. This camp is also a way for the kids to get a lot of undivided attention, something Jones says was hard to come by when his twin brother was sick. He says he and his older brothers and sisters were "kind of pushed off." "They're in groups with their peers, and they can work through kind of processing their feelings and their experiences." The kids get professional attention, too. Group therapy is a big part of the daily activities. In the end, though, this is still a summer camp. Bautista says the bulk of the time will be spent having fun. Jones says making sure the campers have a good time is his No. 1 priority.